We’re really excited that one of our sole-agency location houses is featured in this month’s Grand Designs magazine, photos by Darren Cheung. A stunning modernist home set in the Kent countryside and a unique new architectural gem to add to our roster of stunning shoot locations. That said, as you approach Lee and Rachel’s home (the ‘Tunbridge Wells’ house), nothing prepares you for what you will find. The entrance is unobtrusive, seemingly just a small building, nestled against the long red brick wall of an old kitchen garden. This was once part of a country estate that was carved up and sold off back in the Fifties. But step inside and you’ll see that the original wall runs right through the building and has been used as a defining feature of the house. The main rooms all face inward to enjoy the tranquil privacy of the walled garden, which is the best place to stand and get a sense of the property. Long and low slung with floor-to-ceiling glass windows, it resembles the celebrated Mid-Century Modern houses of West Coast America. In fact this design is, in part, a clever way to pacify local planning authorities. For this house replaces a Fifties bungalow that was built along the opposite wall of the garden. Lee and Rachel bought it in a probate sale, with the plan already in mind to demolish it and start again. The new house is south-facing with four en-suite bedrooms and two living rooms, all on a generous scale that makes them perfect for TV and film location work. The property also conceals a basement level office, gym and store rooms – essential for maintaining a clutter-free minimalist location house. Architects Co3 got the project through the planning stage, while a second firm, ArchitecturAll, took it from there to completion. Lee and Rachel decided on the move here as their daughter and son reached adulthood and the family were no longer confined to living near to schools. In search of a fresh challenge they also craved the simplicity of a maintenance-free home with low running costs. So the house is built along eco lines with an air-source heat pump, and solar panels set into an insulating sedum roof. 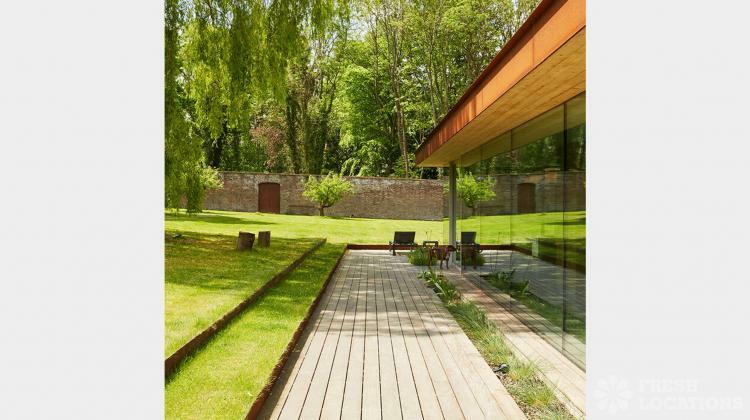 But it is also an aesthetic triumph with a palette of natural and raw materials, like the original brick wall (which was painstaking taken apart and cleaned before being re-laid), Corten steel panelling, poured concrete and oak flooring. The low-key lux interior has been kept deliberately simple – think soft, neutral tones and tactile textures – to avoid jostling for attention with the garden. This vast green space with its mature trees, makes it a great backdrop for the interiors and, of course, for lifestyle location shoots. The island kitchen with its oak cabinets, Corian worktops and hip Tom Dixon lighting is a masterpiece in elegant understatement. Meanwhile, in the living room, the real log fire becomes the focal point after dark.